Get non-stop text messages with the unlimited texts to other networks (SUN, Smart, Globe, TM and Talk ‘N Text subcribers) from Sun Prepaid TextAll Promo. Send all day texts and kamustahan with your friends and loved ones, no matter which network they belong to. 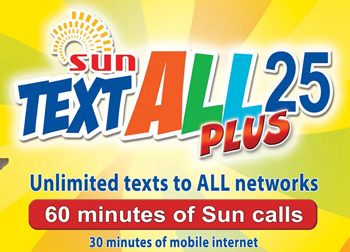 Sun TextAll promo also packed with unlimited Facebook and consumable mobile internet surfing on selected denomination. Load up now! SUN Prepaid TextAll Promo is available in different denomination that suits your budget (15, 20, 30, 25 and 100). To register, simply text the code below and send to 247. Want more updates on the latest SUN Prepaid and Postpaid promo offers? Just visit us again and keep posted as we will feature more SUN Prepaid unlimited text promo. You can also check on www.suncellular.com.ph or at SUN Cellular Facebook page for the latest news feed. If you are also looking for other mobile promos, please visit our Facebook page at www.facebook.com/UnliPromo. do you have promo for unlimited call and text to all networks good for 1 month? there should be a unlimited call and text to all network valid for 1 month.If you have, then what is the key to register? Diko maregister yung 15 load bal. Ko sa UTA15 even TA15. Pano ko to ireregister? Salamat.